The Bavaria Cruiser 45 was built in 2012 and is a fantastic sailboat for your dream sailing holiday. With 4 cabins that accommodate 9 guests, this boat is ideal for a relaxing getaway with your significant other or a romantic escape. A gorgeous sailboat, she is both spacious and generous. This boat is located in D-Marin Marina Dalmacija (Sukošan) and is the perfect vessel for discovering all the hidden gems of the coast in Sukosan. 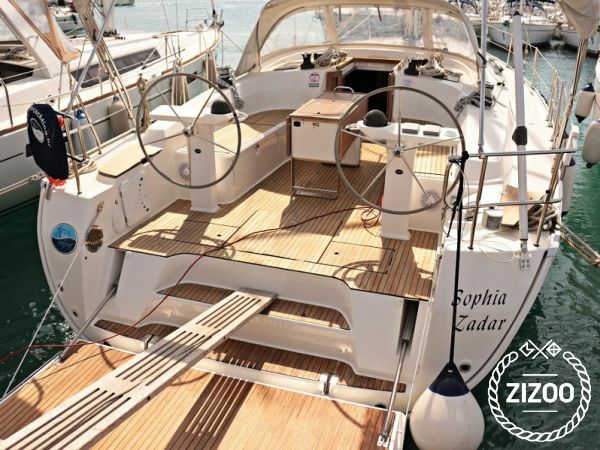 The Bavaria Cruiser 45 is a wonderful model that is a very stylish and slender option for your next sailing holiday. Book it now and prepare to set sail!. Wir wollten dieses mal etwas anderes wagen und haben uns gegen den klassischen Strandurlaub und für einen Segelurlaub entschieden. Super Entscheidung! Das Boot hat uns gut gefallen, der Verchartere war sehr feundlich und ZIZOO hat uns nicht Seglern wirklich bei der ganzenPlanung mit ihrem Wissen und Ihrem Kundenservice geholfen. Wir können es nur weiterempfehlen! Unser Urlaub war ein Traum! Der ganze Buchungs/Abhol Prozess lief ohne Probleme ganz entspannt ab und das Boot war in bestem Zustand. Requested 41 times this week!